Many people on many different forums repeatedly talk or write about punishment. I think there is too much emphasis on punishment, and not enough on learning. discipline in the home - not domestic punishment. and then make rules as guidelines. Then comes the punishment for breaking these rules. We all learn by doing - we learn from our mistakes. Why punish someone who is trying to find their way in something so completely new as a domestic discipline relationship? Being a teacher, I know that criticism (read: punishment) is not the best way to teach/learn something new. No one likes being punished or criticized in the learning phase - it's a negative action. Do parents yell at a baby when it's learning to walk, every time it falls down? Why should a new DDer be punished from day one? From my own teaching experience , I know that I get much better results with discussion and praise. Learning Domestic Discipline is no different. There are a million old habits that need to be un-learned. There is a new mind-set that needs to be learned and then internalized. There are new roles to accept and new responsibilities to take on. There is a new form of communication to employ. There are a new rules to abide by. Of course newbies will make mistakes in the beginning -Learning or being disciplined is fine - but being punished is not the right way to go about it, in my opinion. It really takes a long time to re-learn so many new things. Here at our house - we've come up with learning reminders. Small spankings that help me learn to embrace the role of a submissive wife to my hubby and not contradict him and his decisions all the time. They also teach me to respect that his word is final and to obey his decisions - and to stop negotiating with him on every little thing. These small reminders help Jack learn to take control, be the man of the house, embrace his new role as leader and take responsibility for the both of us. DD keeps him on his toes and he is learning to play an active part in our marriage - and..
we are learning to communicate in a whole new way. The only reason I can think of to really punish someone, is if they do something to hurt the relationship - on purpose. 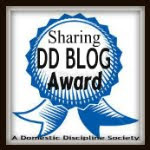 I guess the point of this blog is to say that Domestic Discipline is not all about punishment, but about learning a new lifestyle that will make everyone happier. Happy New Year dear DD friends!! I agree. Working on the relationship through communication is vital, especially in the beginning. Sometimes people don't take the time to build better communication skills before rushing to "punishment". There is a progression of discipline that takes place where punishment is a later or last resort after many other ideas and disciplinary actions have been discussed and taken. Thank you MrBBSpanker -you always have great answers and I learn so much from your site! You make an excellent point Jill. It I have said it once to my husband I have said it a million times...lol That ttwd isn't all about spanking. He is having a difficult time as he puts it " wrapping his head around punishment". I have said that just acknowledging behaviour he doesn't enjoy is critical too. Even a simple , " Knock it off" <- okay he wouldn't say that but you get the idea. He is more sensitive as to the why I am acting out so even a " I know you are stressed about xyz but that is no way to talk to anyone let alone me". Would go a long way in my opinion. I think that's pretty much how we operate. I don't feel like I've ever gotten a "severe" spanking like many blogs talk about. I think most of mine are more like reminders, too. I'm glad to hear it - me too!! I think that punishment *can* be used effectively in a DD relationship, but that it takes a smart and perceptive HoH. By punishment I mean deterrent or negative consequence rather than criticism. But...punishments tend to make people angry, hurt, confused, and upset. It takes a really strong relationship to use them in a constructive way. Why write twice - when you can add a link. Going to your site now. Punishment for Fair Lady is me telling her that she's let me down, or that I'm disappointed in her. Telling her that gets more tears than any spanking I could give her. Spanking her allows her to be submissive, and reminds her that she belongs to me. I see picture of "punishment" spankings where the wife has severe bruises. I couldn't imagine doing that to Fair Lady. When I'm really upset with her, which isn't very often, I don't spank at all. I completely agree that it's about learning. It's been quite the adventure for us and I still feel like there's so much to learn. There are so many ups and downs. It's the roller coaster of relationships - but so worth it! Thank you for writing this post. You've articulated many thoughts I have had in my head for weeks. Excellent post. Blogging is a great way to air out ones thoughts. I find things get clearer along the way!